VisionWeb Control is a free-of-charge way of operating the full Crystal Vision product range from a web browser. 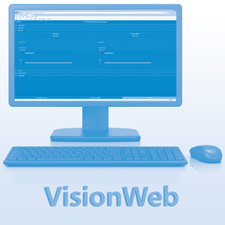 Using VisionWeb Control requires any Vision 3 frame or an Indigo 'AE' or 'SE' frame running software version V5.0 software or later and a web browser running on any device connected to your network - that's all. VisionWeb is ideal for configuring any system - big or small. VisionWeb Control uses a board's XML control interface, which is stored in the front panel of the latest Indigo frames and on the CPU card in the Vision frames. To access the control menus, the operator simply types the IP address of the frame into a web browser running on any device that is connected to the same network – you can even use a tablet or phone if your frame is located on a wireless network. The web provides a common interface across operating systems and platforms, and by using a web-based system Crystal Vision can support a wide range of devices. VisionWeb features well-laid out and intuitive graphical control panels which scale well across a wide range of display sizes. VisionWeb allows control from multiple devices at the same time and works best with up-to-date versions of any browsers including Internet Explorer, Firefox, Chrome and Safari. Using VisionWeb the operator can control and monitor the status on all of the products. 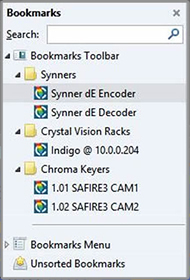 The browser's Bookmarks and Favourites make it easy to navigate between frames and boards: products can be organised into folders with meaningful names added to help identify boards, while Mozilla Firefox's powerful Bookmarks Search can be used to quickly locate a specific board. Three useful VisionWeb features are frame and slot labelling, virtual cards and password protection. VisionWeb's password protection uses a standard protocol called HTTP Basic Authentication and allows a user to control access to all the boards in a frame by editing a list of username/password pairs inside the frame. Once this is in place anyone can see a list of boards but they need to input a username and password to 'open' any boards on VisionWeb and therefore access any controls. You can password protect chosen slots or virtual slots within the frame - perfect if you are concerned about users accessing and adjusting things they shouldn't. You can either password protect a specific board within a frame, or you can combine restricted slot access with virtual cards, allow you to define user access control by control. You could put all the controls an operator should have access to on a single virtual card and then give them access only to that card. Alternatively you could have multiple virtual cards, each defining an area of operation, and give operators access to different sub-sets of those as required. VisionWeb includes the ability to back up and restore settings on the Indigo frames and both settings and presets on the Vision frames. Providing enhanced security and convenience and especially useful for big systems, this feature makes it easy to duplicate installations, put replacement boards into the correct state and return an installation to a recorded state. When a frame is turned on, the frame and board settings will be automatically backed up to the frame CPU. When a change is made to the frame or board settings, these live state changes will be automatically backed up to the 'backup' folder on the frame CPU, replacing the previous backup file. Using FTP within Windows Explorer you can move copies of the backups into the 'import' folder on the frame CPU, which allows you to have snapshots of frame and board settings at different points in time. You can also move files on to your PC for safe storage. Settings can be restored either automatically or manually using VisionWeb. You can turn on 'auto restore' for any chosen slot within the frame: removing a board from a slot and replacing it with another one will trigger this auto restore, with the settings file taken from the 'backup' folder. Alternatively you can manually restore frame and board setting using a file selected from the 'import' folder on the frame CPU. Alarms setting is not available on VisionWeb, and those who are interested in system monitoring are recommended to use SNMP traps. VisionWeb Control can be used with Crystal Vision boards which have remote control capability plus an associated XML file. Obsolete products which can be controlled by VisionWeb are ADDEC-310, AVDELAY 3G, Demon 2, Dual 3G-DL, Dual DL-3G, FTX 3G, LKEY HD, MultiLogo V131, MultiLogo V131 8G, MultiLogo V431, MultiLogo V431 8G, Q-Down123, Q-Down183, SYN103 and ViViD HD-20. Older Indigo frames running V4.7 software or later can be updated to full VisionWeb control of all products - contact our support team to request the latest software for your frame. If you're running earlier versions of the front panel software, please contact our support team for an update feasibility analysis.